VMware Inc. (NYSE: VMW), a global leader in cloud infrastructure and business mobility and Gold level member of Oracle PartnerNetwork, and Oracle recently announced a new relationship to simplify management and enable advanced security features for Oracle’s suite of mobile business applications and Oracle Mobile Cloud Service (OMCS) for mobile devices. Oracle has the most enterprise mobile applications in the Apple App Store and was also named a leader in The Forrester Wave™: Mobile Development Platforms, Q4 2016. Through this collaboration, Oracle’s robust mobile ecosystem can now leverage application management and security through VMware AirWatch®. VMware is the first mobile application management provider to manage and secure hundreds of Oracle business applications and custom applications built on the OMCS. As such, enterprise IT organizations can manage their Oracle application suite on a single unified platform together with their other business-critical applications and devices. Users who count on Oracle’s business applications to make better decisions, reduce costs and increase performance can benefit by being able to access these applications through a simple digital workspace environment – be it from a mobile device, laptop or desktop – with VMware Workspace ONE™ and AirWatch. The US International Trade Commission has upheld a judgement that Arista Networks infringed two Cisco Systems patents on networking equipment – the latest round in a long-running legal battle between the companies. In a judgement last week, the federal agency called for an import ban and a cease and desist order on related products. Its decision upheld findings of an administrative law judge in December that switches sold by Arista infringed Cisco’s patents. Mark Chandler, Cisco’s senior vice president and general counsel, wrote in blog post company blog post: “The Commission’s decision is the latest of several findings that Arista has intentionally and unlawfully copied Cisco’s proprietary technology.” Chandler wrote that “by confirming Administrative Law Judge McNamara’s Initial Determination, the Commission brings the total confirmed Arista patent violations to five”. The ITC action is one of two Cisco has brought against Arista. 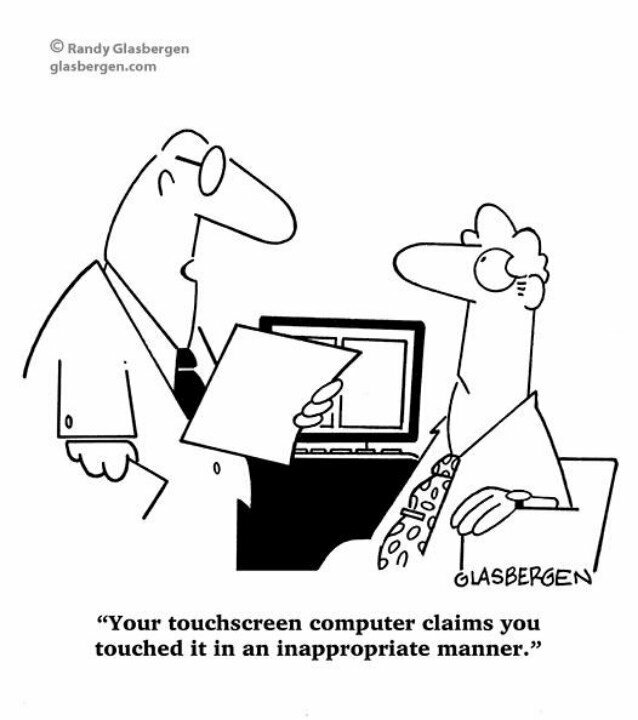 In the other, the ITC found Arista infringed three of five patents related to Ethernet switch products. According to Cisco’s 2016 VNI report, Wi-Fi now accounts for 60 percent of all connections to the internet and they estimate that the number of public Wi-Fi hotspots worldwide will grow to 540 million in 2021. But with more and more people connected to the internet wirelessly, the risk of digital attacks increases as well. Ryan Orsi, Director of Product Management at WatchGuard Technologies, recently wrote an article in Cyber Defense Magazine titled The Anatomy of a Wi-Fi Hacker in 2017. In it, he unpacks the various ways a hacker might attack an innocent Wi-Fi user, or infiltrate a Wi-Fi network such as a man-in-the-middle attack (MitM), a Karma attack or by using a tool like Hack5’s Wi-Fi Pineapple. Ryan also explains the OSI model and how most major, headline-grabbing security breaches are application or layer 7 attacks. But most Wi-Fi hacks take place at layer 2 in the OSI model, the data link layer, and are much more difficult to track. Companies notice when Yahoo loses another billion user account identities or Ashley Madison gets breached, but hackers using fake Access Points skim people’s credit card information every day around the world with no one the wiser. 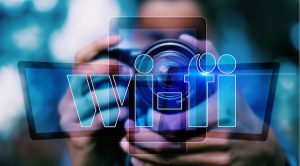 If using public Wi-Fi exposes the public to a variety of security risks, and the MitM attack is the root of most Wi-Fi evil, what’s the solution? VPNs (Virtual Private Networks) can make connecting safer, but not everyone knows how to use a VPN and it relies on the end-user taking action. Passwords on SSIDs can also help, but the four-way WPA2 handshake is easily decrypted in minutes by GPU accelerations or other resources on the dark web. In part two of this series titled “Defending You Airspace,” I’ll explain how organizations can use the latest technology to provide secure public Wi-Fi, and take the end-user out of the “security equation.” In the meantime, be diligent when at the local mall or coffee shop. Read Ryan’s full article on Cyber Defense Magazine and keep an eye out for part two of this series. Additionally, you can find some best practices on staying safe while surfing the web via public Wi-Fi during the holidays here from WatchGuard, Information Security Threat Analyst, Marc Laliberte. Please note: this article summary and exerpt comes from WatchGuard Technologies’ Secplicity website. WatchGuard Wi-Fi Road Show coming to the Twin Cities! Mark your calendar! The WatchGuard Wi-Fi Road Show is touring the country in the coming months, and a stop, co-sponsored by Verus, is scheduled for Tuesday, June 20, from 3:00 pm. to 6:00 p.m. at Wildfire Restaurant, 3020 Eden Prairie Center, Eden Prairie, MN. This road show highlights the new secure Wi-Fi solutions being rolled out by WatchGuard. Look for more information in next month’s newsletter. 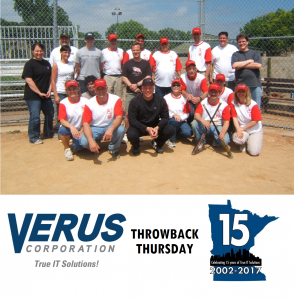 As announced in last month’s Verus Insider, we are celebrating our 15 year anniversary as a company. Today, we have more employees than we’ve ever had, all to serve you, our customers. 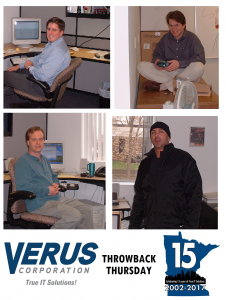 As part of our celebration, we’ve been looking back to the early days of Verus, with fewer people, but just as much commitment. Our Throwback Thursday can be found on our LinkedIn and Twitter accounts every Thursday. We hope you enjoy! According to the FBI, there were an average of 4,000 ransomware attacks per day in 2016. Up 300 percent from 2015. And that number continues to rise in 2017. 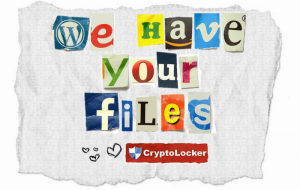 Don’t be a victim that ends up paying ransom on your own company’s data. Join Verus and WatchGuard for an IT security presentation and happy hour on Tuesday, June 6, from 3:30 p.m. to 6:00 p.m. at Pinstripes-Edina, located at 3849 Gallagher Dr., Edina MN, 55435. 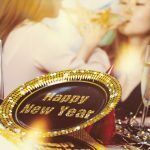 The event will include a presentation on “Main Street Is the New Cyber Battleground,” followed by drinks, appetizers, and the chance to play bocce ball or go bowling on us. Every attendee will receive a free iBoost Executive phone charger. In addition, a drawing will be held for a Syma X5C Exporers 2.4G 4CH 6-Axis Gyro RC Quadcopter drone. Must be present to win. Most importantly, however, you will learn about the new evolution of security to protect your network and data from evasive malware and ransomware. If you’re interested in attending, please RSVP to events@veruscorp.com or call 763-354-2266 today! Due to limited capacity, this event is on a first come, first served basis. Put a skillet over medium heat and drizzle in a 2-count of olive oil. When the oil gets hazy, add the onion and garlic and cook, stirring, until it is soft and translucent, about 5 minutes. Add the ground beef, breaking it up with the back of a spoon, and cook until nicely browned, about 10 more minutes. Stir in the ketchup, chili powder, and mustard and simmer for 15 minutes until thickened. Season with salt and pepper. While the chili is cooking, get the grill going. Place a large grill pan on 2 burners over medium-high heat or preheat an outdoor gas or charcoal barbecue and get it very hot. Take a few paper towels and fold them several times to make a thick square. Blot a small amount of oil on the paper towel. Then carefully and quickly wipe the hot grates of the grill to make a nonstick grilling surface. Bring a pot of water up to a simmer and parboil the dogs for about 5 minutes. Take them out of the water, pat them dry, and grill them just long enough to mark them. (That’ll give them a grilled flavor too.) Brush the insides of the rolls with olive oil and lay them face down on the grill; cook until toasty. 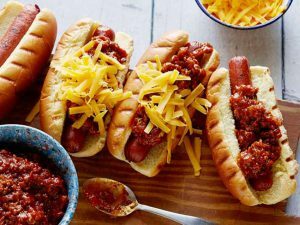 To serve, put a dog in each roll and top with the chili and some Cheddar. 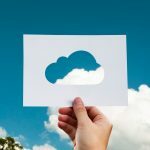 Are Your Cloud Security Solutions Tailored to Your Business?